"Maracanazo" redirects here. For the 1989 football match between Brazil and Chile, see El Maracanazo. Uruguay v Brazil was the decisive match of the final group stage at the 1950 FIFA World Cup. The match was played at the Estádio do Maracanã in the then-Brazilian capital of Rio de Janeiro on 16 July 1950. Unlike other World Cups, the 1950 winner was determined by a final group stage, with the final four teams playing in round-robin format, instead of a knockout stage. With Brazil one point ahead of Uruguay going into the match, Uruguay needed a win while Brazil needed only to avoid defeat to claim the title of world champions. Brazil took the lead shortly after half-time on a goal by Friaça, but Juan Alberto Schiaffino equalised for Uruguay midway through the half. Alcides Ghiggia scored the winning goal with 11 minutes remaining in the match, resulting in one of the biggest upsets in football history, and the term Maracanazo (Portuguese: Maracanaço, pronounced [maɾakɐˈnasu], roughly translated as "The Agony of Maracanã", after the name of the stadium) became synonymous with the match. It was the second (and to date, the last) final match featuring two South American teams (the first being the 1930 final between Uruguay and Argentina, which was also won by Uruguay). Ghiggia was the last surviving player from the game; he died on 16 July 2015 (exactly 65 years after scoring the decisive goal) at the age of 88. The road to the title in the 1950 World Cup was unique; instead of a knockout stage, the preliminary group stage was followed by another round-robin group. The final four teams were Brazil (the host country and joint-top scorers from the group stage, coming from wins over Mexico and Yugoslavia and a draw against Switzerland), Uruguay (who only had to play one match in their group, an 8–0 thrashing of Bolivia), Spain (who won all three of their group matches, against England, Chile and the United States), and Sweden (who qualified ahead of the defending world champions, Italy, and Paraguay). Brazil won both of their first two matches convincingly, beating Sweden 7–1 and Spain 6–1 to go top of the group with four points going into the final match. With three points, Uruguay were close behind in second place, although they had to come back from 2–1 down to draw 2–2 with Spain, before beating Sweden 3–2, the winning goal coming just five minutes before the end of the game. In the match between Sweden and Spain, Sweden needed a win to move ahead of Spain, and finish third in the World Cup. Spain would claim third place with a draw, or even tie for second with a victory, combined with a defeat for Uruguay, something not unlikely after Brazil had scored 13 goals in the previous two matches. The match between Brazil and Uruguay, on the other hand, would decide the title; a victory or a draw would grant Brazil the title, whereas Uruguay had to win the match in order to win the championship. The game is often listed as the 1950 World Cup Final, although strictly speaking this was not the case; it was merely the decisive match in the tournament. The specialised press and the general public had already started declaring Brazil the new world champions for days prior to the final match, and they had reasons to do so. Brazil had won their last two matches with a very attack-minded style of play against which all efforts had proved fruitless. Uruguay, however, had encountered difficulties in their matches with Spain and Sweden, managing only a draw against Spain and a narrow victory over Sweden. When those results were compared, it seemed that the Brazilians were set to defeat Uruguay as easily as they had dispensed with Spain and Sweden. Moreover, in the Copa America, also held in Brazil the previous year, the hosts won by scoring an astounding 46 goals in just eight matches. Ecuador felt Brazil's wrath when they were beaten 9-1, Bolivia were decimated 10-1, while even runners-up Paraguay were not spared and were beaten 7-0. Brazil furthermore beat Uruguay 5-1. Twenty-two gold medals were made with each player's name imprinted on them and the mayor of Rio delivered a speech with the words: "You, players, who in less than a few hours will be hailed as champions by millions of compatriots! You, who have no rivals in the entire hemisphere! You, who will overcome any other competitor! You, who I already salute as victors!" A victory song, "Brasil Os Vencedores" ("Brazil The Victors"), was composed and practised, ready to be played after the final. However, Paulo Machado de Carvalho, head of the Brazilian squad that won the World Cups of 1958 and 1962, and was then a São Paulo FC leader, thought exactly the opposite. During a visit to the training session at the Estádio São Januário on the eve of the game, Paulo found several politicians making impassioned speeches to the players, as well as journalists, photographers and others arriving to join the "future champions". When he warned coach Flávio Costa about the risk of upsetting the players' concentration, Paulo was ignored. Frustrated, he told his son Tuta, who was with him: "We are going to lose". On the morning of 16 July 1950, the streets of Rio de Janeiro were bustling with activity. An improvised carnival was organised, with thousands of signs celebrating the world title, and chants of "Brazil must win!". This spirit was maintained right up until the final minutes of the match, which filled the Maracanã Stadium with a paid attendance of 173,830 and an actual attendance estimated to be over 200,000. 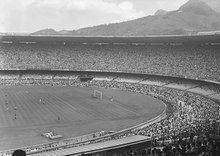 This record attendance for a team sports event is unlikely to ever be broken in an era where most international football matches are held in all-seater stadiums; at the time the Maracanã was mostly concrete grandstands with no seats. The Brazilian newspaper O Mundo printed an early edition on the day of the final containing a photograph of Brazil with the caption "These are the world champions". Uruguay's captain, Obdulio Varela, bought as many copies as he could, laid them on his bathroom floor and encouraged his teammates to urinate on them. In Uruguay's dressing room in the moments prior to the match, coach Juan López informed his team that their best chance of surviving the powerful offensive line of Brazil would come through adopting a defensive strategy. After he left, Varela stood up and addressed the team himself, saying "Juancito is a good man, but today, he is wrong. If we play defensively against Brazil, our fate will be no different from Spain or Sweden". Varela then delivered an emotional speech about how they must go against all odds and not be intimidated by the fans or the opposing team. The speech, as was later confirmed, played a huge part in the final outcome of the game. In response to his squad's underdog status, the captain delivered the memorable line, "Muchachos, los de afuera son de palo. Que comience la función" ("Boys, outsiders don't play. Let's start the show"). The game began as form predicted, with Brazil attacking against the Uruguayan defensive line for the majority of the first half. Unlike Spain and Sweden, however, the Uruguayans managed to maintain their defence and the first half ended scoreless. Brazil scored the first goal of the match only two minutes after the interval, with São Paulo forward Friaça shooting low past goalkeeper Roque Máspoli. After the goal, Varela took the ball and disputed the validity of the goal to the referee, arguing that Friaça was offside. Varela drew out this argument, going so far as to demand that the referee listen to him through an interpreter. By the time the conversation ended, the crowd had calmed down, then Varela took the ball to the center of the field, and shouted to his team, "Now, it's time to win!" Uruguay managed to take control of the game. When faced with a capable Uruguayan attack, Brazil showed their frail defense, and Juan Alberto Schiaffino scored the equaliser in the 66th minute. Later, Alcides Ghiggia, running down the right side of the field, scored another goal, with a low shot that went just under goalkeeper Barbosa, with only 11 minutes remaining on the clock. The crowd was virtually silent after the second Uruguay goal until English referee George Reader signalled the end of the match with Uruguay winning 2–1. The 1950 FIFA World Cup is the only version of the tournament to be played with a round-robin final round, and as such is the only FIFA World Cup to date to not have a deciding knock-out final. As it was the last game of the tournament, and the result of the match directly determined the winner, the match has come to be commonly referred to as the final, including by FIFA itself. When the match ended, people said the stadium was filled with "disturbing and traumatic absolute silence", except for the euphoria and celebration of the Uruguayan players and delegation. In Brazil, many newspapers refused to accept the fact that they had been defeated; famous radio journalist Ary Barroso (briefly) retired, and some distraught fans even went so far as to commit suicide. However, Brazil did later rebound and win back-to-back World Cups in 1958 and 1962. Two unused squad members of the 1950 team, Nílton Santos and Carlos José Castilho, were also members of the victorious Brazil squads that were to come. Santos played in both finals whereas Castilho only played in the 1954 FIFA World Cup and in 2007 was posthumously awarded the 1958 and 1962 winning medals as a squad member, having been Gilmar's reserve in both tournaments. Four members of the team, the captain Augusto, Juvenal, Bigode and Chico never played for Brazil again. The already made 22 gold medals were discarded, never to be seen again, and the already composed song "Brasil Os Vencedores" was never performed. Brazil's white shirts with blue collars that were worn in the final game were, in the wake of the defeat, subject to criticism by the country's sports federation for being "unpatriotic", with pressure mounting to change the colours. In 1953, a competition was held by the newspaper Correio da Manhã to design a new outfit, with the rule being that it must incorporate the colours of the national flag. Eventually, the competition was won by Aldyr Garcia Schlee, a newspaper illustrator, who came up with the design of a yellow shirt with a green trim, blue shorts and white socks that was first used in March 1954 against Chile, and has been used ever since. When Brazil first won the World Cup in 1958, they wore their away kit as the new colours clashed with those of hosts Sweden. The term "Phantom of '50" was later used to refer to the fear that Brazilians and Brazil national football team feel of the Uruguay national football team due to this loss. Each time Brazil and Uruguay play at Maracanã Stadium, the theme resurfaces. In 1993, after losing important games, Brazil was struggling to qualify for the 1994 FIFA World Cup. The final match of the qualifying South American group between Brazil and Uruguay was tense, surrounded by fear, as Brazil needed to win the game to qualify. Brazil beat Uruguay by 2–0, with two goals by Romário, who had been ignored in the tournament and was urgently called in to save Brazil. The theme reappeared in the Brazilian press as Uruguay qualified for the 2014 FIFA World Cup. Uruguay often emphasized the theme, giving the team motivation and encouragement in matches against Brazil. When Brazil hosted the 2014 FIFA World Cup and again had a hard defeat, this time a 1–7 humiliation in the semi-final with Germany in Belo Horizonte, the game was subsequently known as "Mineirazo", given it took place at the Mineirão stadium and echoed the same sense of defeat as in 1950. Barbosa's daughter said the 2014 loss was enough to redeem her father's legacy, and most of the Brazilian media took the opportunity to contrast the 2014 semi-final as an embarrassment compared to the close defeat in the Maracanazo. Ghiggia himself stated that while both games were traumatic, they could not be compared as the 1950 game had more at stake. ^ "World Cup 2018 by Numbers". telegraph.co.uk. 2 December 2010. Retrieved 4 November 2015. ^ "Carrasco em 1950, Ghiggia morre no aniversário do Maracanazo" (in Portuguese). Terra. 16 July 2015. Retrieved 17 July 2015. ^ Alex Bellos (29 March 2004). "Fateful Final: 1950 World Cup in Rio de Janeiro's Maracanã". Futebol: The Brazilian Way of Life. brazilmax.com. Archived from the original on 18 September 2010. Retrieved 20 May 2010. ^ "Sambafoot.com: Maracanã, the largest stadium of the world". sambafoot.com. Retrieved 20 June 2014. ^ "Uruguay's 1950 World Cup triumph a testament to the spirit of garra". CNN. 4 July 2010. ^ Hughes, Rob (12 June 2014). "In Brazil, It's Time For the World to Play". New York Times. Retrieved 20 June 2014. ^ "FIFA World Cup™ Finals since 1930" (PDF). FIFA. Retrieved 31 January 2014. ^ "Become an instant expert... on Brazilian football" - BBC. ^ "World Cup: 25 stunning moments: Uruguay's 1950 triumph v Brazil" - The Guardian. ^ Bellos, Alex (27 June 2014). "World Cup 2014: Meet the Uruguay fan who designed Brazil's iconic yellow kit". The Independent. Retrieved 8 July 2018. ^ Ben Smith (28 June 2014). "The story of Brazil's 'sacred' yellow and green jersey". BBC News. Retrieved 28 June 2014. ^ "The Mineirazo in numbers". FIFA.com. FIFA. 8 July 2014. Retrieved 8 July 2014. ^ "Del Maracanazo al Mineirazo" [From Maracanazo to Mineirazo]. Página 12 (in Spanish). AR. ^ Nolen, Stephanie (9 July 2014). "Brazil, losers on the field, now turn to the blame game". The Globe and Mail. Retrieved 1 September 2014. ^ Avelar, André (9 July 2014). "Jogadores de 50 enfim são perdoados após Mineirazo" (in Portuguese). R7 (Rede Record. Retrieved 5 September 2014. ^ ""O Maracanazo é diferente porque foi uma final", afirma Ghiggia" (in Portuguese). Agência EFE. 9 July 2014. Retrieved 1 September 2014. This page was last edited on 17 April 2019, at 21:16 (UTC).